‘Life does not end with a dementia diagnosis’ – is one of the key tenets of Clifden House in Seaford. With our mission to help our residents, who all suffer with dementia, to continue to live a fulfilling and engaging life we run an impressive variety of activities and events. “This allows every resident to engage as much as they desire with the world around them, both within and outside Clifden House,” said activity coordinator, Deena. 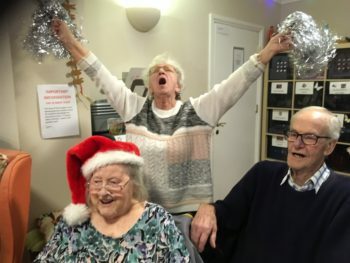 Some of the recent events at the home included supporting the Wave Charity with a number of residents attending its recent concert in the town. This was followed by all the residents attending, at least one of several, pantomimes over the holiday period. Bus trips with lunches at various local towns plus several musical performances at the home are a regular occurrence. Nevertheless it is always The Swing Time Sweethearts’ visit to Clifden that raises the roof with their wide range of 1940’s wartime and swing songs. Clifden House’s annual raffle raised almost £200 thanks to the generous donations of over 20 local retailers and suppliers. These include Cost Cutters, Onneka, Bobs, Toy Town, Seaford’s Greengrocer, Shahjahan Indian, K&L Jewellers, Marks Jewellers, Scoop & Weigh, Cloe’s Coffee Shop, JK Pope, Oscar Computers, Totally Wicked, Jason’s Barbers, Seaford Motorcycle, Biker Bits, Angies Newsagent, Redgold Opticians and Phoenix Hair and Beauty. The money will be used to buy a large gaming table for the residents to use.